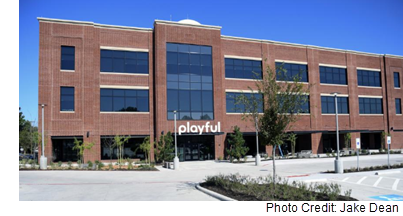 ​ ​McKINNEY – Gaming development company Playful recently relocated 72 employees from downtown McKinney into a 55,000-sf building several blocks away at 207 E. Davis St. The company’s new office is more than twice the size of its last home. The newly constructed three-story building, made possible by an economic development incentive from the city, mirrors the signature red brick of McKinney’s historic downtown. Reclaimed wood, brick and dark metal make up the industrial aesthetic of the building, which was designed by Dallas design firm Corgan.